Uncertainty in global trade from changing import tariffs can affect your U.S. Customs bond and your profitability. Here at Shippabo, a supply chain management company, we’re seeing the changes across the board in ocean shipping. Import cargo volume and rates are increasing as importers race to bring in their cargo before new tariff increases. The changes and uncertainty can feel chaotic. 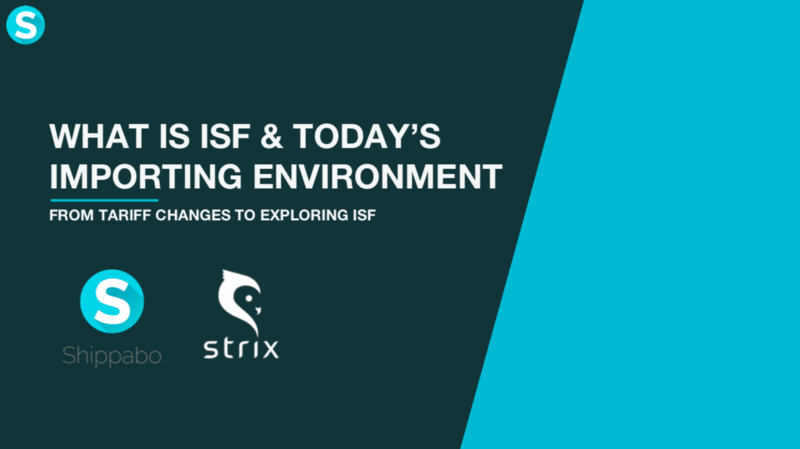 So Strix (Customs entry and ISF software) and Shippabo joined forces to review these changes in an hour-long webinar. You can watch the webinar and access the presentation here. And read our quick recap below. In the webinar, Gregg went into detail as to why these changes to import tariffs are taking place. Watch the webinar, starting at 13:00, to hear Gregg’s explanation..
What is the Section 232? The Section 232 tariff has two parts. First, it includes a 25% tariff on steel imports into the U.S. that is in place today. As of June 1, 2018, all countries are subject to the tariff — with the exceptions of Argentina, Australia, Brazil, and South Korea. The second part includes a 10% tariff on aluminum imports into the U.S. As of June 1, 2018, all countries are subject to the tariff — with the exceptions of Argentina and Australia. Imports of U.S. origin aren’t subject to Section 232 measures. Currently, no drawback is available with respect to the Section 232 tariffs. What is the Section 301? List 1 products: A 25% tariff on 818 products valued at $34 billion worth of imports from China that went into effect on July 6, 2018. These tariffs are based on country of origin, not country of export. They are eligible for drawback. List 2 products: 25% tariff on products from China for what originally included 284 items and now includes 279 products, worth $16 billion. These tariffs are based on country of origin, not country of export. These went into effect on August 23, 2018. List 3 products [Possible]: The U.S. Administration announced an additional list of tariffs, as of July 10, 2018. It proposes a 25% tariff for 6,000+ items worth $200 billion from China. The space is rapidly changing. It seems there are general discussions around a potential List 4 that adds an additional $500 billion. The Bond Amount on your U.S. Customs Bond is based on your total annual duties, taxes, and fees. That means if you have an increase in your duties, you may also have an increase in your bond amount. Through the implementation of the new 232 and 301 Tariffs, U.S. Customs has been immediately deeming bonds insufficient. An ocean freight importer will not be able to continue importing until a new bond has been placed. In the webinar, Gregg dives into further detail on how the change to your customs bond impacts your business. Gregg also covers what you can do, starting with a great free tool from Trade Risk Guaranty: a Section 301 - HTSUS Code Lookup. If you want to learn more about how these tariffs affect your U.S. Customs bond, head to the webinar.